Today is my marriage anniversary. I have been married for n years (I won’t tell you the value of n as it is a very large number and you will start guessing my age!). Coincidentally, Ambika, my wife, has also been married for the same number of years. Ambika has been the best thing that has happened to me. If you wonder if she feels the same way, feel free to ask her and I am confident she too will agree that she has been the best thing that has happened to me. I am glad that I fell in love with Ambika over the few other girls I thought I loved. I am told by my women friends that the reason why god created man first and woman second was because he needed to have a rough draft before he made a masterpiece. If one sample couple can prove the hypothesis, look no further. I met Ambika at a Chartered Accountancy class. I did not want to fall in love then, as I thought that it would be like learning how to cycle – would take a lot of time and would get injured in the process. But to my surprise, it was love at first sight. Then I took a second look. And a third. I have never looked back again. On our first date, like all men, I told her a bunch of lies which got her interested enough to go for future dates. Being an extraordinarily handsome man, I assumed it my responsibility to marry the perfect woman so that we could produce children beyond comparison. So I immediately decided to marry Ambika. Of course, she decided a lot later. Ambika believed that the poorest people are the happiest. And now that she is married to me, we are the happiest couple. We used to always hold hands after marriage because we wanted to make sure the rings did not fall off since we paid good money for them. We have been sharing things ever since – we use the same toothpaste though different toothbrushes, the same bath soap though different bath towels, the same dining table though different plates, the same closet though different clothes, the same television though different shows, the same bed…. Sorry, this is a family blog, remember? All married men contend that marriage is not a word but a sentence. However I don’t agree; I would like to look at it as an ‘investment’ that pays big ‘dividends’ if you manage to keep up the ‘interest’ (from this you would have guessed my profession – yes, I am an accountant). My wife and I always compromise which has been the secret behind our co-existence; I admit that I am wrong and she agrees with me. We have had a very successful marriage so far, because I practice in my life what I preach at work. I work for an outsourcing company and as a true-blood loyal employee I have outsourced the decision-making process to my wife. She is the boss in our house. I have seen the kind of things she does in the house as part of this job and honestly, I do not want it. This does not mean that we have not had our rough times, like when I send my wife an SMS ‘I wish you were here’ thinking that it was a smart thing to do, but mistakenly missed the last e in ‘here’, or when I forgot my wife’s birthday. I realized at that time that our marriage can be defined as the alliance of two people; one who never remembers birthdays, and the other who never forgets them. During the process I found that the best way to remember my wife’s birthday is to forget it thrice. But I cannot ‘remember’ the last time I ‘forgot’ her birthday. We have stuck together during the good and bad times all these years. Just a note of caution for the readers – families that stick together should bathe more often. We have a little girl amongst us now, our daughter Niharika. The store had run out of the big ones. And even the little one took nine months to download. O that note, the child experts say that men should not have children after 35. It may sound very restrictive, but they say that there is research evidence to support this. 35 children are enough! PS: If you assume that I was coerced by my wife to write this blog dedicated to her, then you should be married. Oh by the way, didn’t I mention that this is dedicated to her! 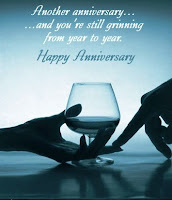 Hiii Salil...wish u a very happy wedding Anniversary..
your wife should be very happy with this beautiful dedication. maybe the camera will prompt a photoblog? wish u a happy anniversary..
thanks for your comment on Bisleri moments. Yeah, on getting paid - i am looking for the Bisleri Brand manager. And here is wishing you both a Happy Anniversary. hey there salil,its mere bloody luck that we get a partner of choice..All the best to both of you. And regarding handsome and perfect union, you see, it was my responsibility, as per my good friend Darwin. Soon our progeny will take over the world! I am not sure a photoblog is on its way any soon, because I was overwhelmed by the features of the DSLR. It may take ages for me to get a good command over them. Thanks for passing by and the wishes. Oh my, look who is here at my blog finally! My dear wife! But I had to hire a wife to celebrate it since you were not here. And psst psst, nobody has realized that you had to beat me up to make me write this post. Thank you for your wishes and comment. Of course, I can read malayalam. I will be there soon. I hope you have heard this : "When a newly married couple smiles, everyone knows why. When a ten-year married couple smiles, everyone wonders why." Well.. a lovely post for a lovely lady.. Happy Anniversary Salil and Ambika...May god grant u all pleasures of life! lol salil.. yeah.. have heard those jokes.. but to put them all together and post in ur blog.. oh man!! u must b brave :D..
Best wishes Salil & Ambika. You left the sentence incomplete – A lovely post for a lovely lady by a lovely gent. "It is easy to be brave from a safe distance - Aesop"
Is that all.. I mean, IS THAT ALL?? You know both of us so well. I thought you will leave some kind, understanding, consoling, words, you unsympathetic married man! it's difficult to list down whats the best part of this blog....i mean the best from the best. Your blog was good. You should write more often. A couple on their anniversary received in the mail two tickets for a popular show where tickets were impossible to get. They were very excited and warmed by the gesture of the person who sent this. Inside the envelope, however, was only a small piece of paper with a single line, "From...guess who?" The pair had much fun trying to identify the donor, but failed in the effort. They went to the theatre, and had a wonderful time. On their return home late at night, still trying to guess the identity of the unknown host, they found the house stripped of every article of value. And on the bare table in the dining room was a piece of paper on which was written in the same hand as the enclosure with the tickets: "Now you know!" Hi salil and Ambika, belated vivahavarsha asamsagal. Got here through jammy's blog. I couldn't resist reading most of your posts. Must say, you have a way with words. Looking for more. wow!! Happy anniversary Salil :). Nice post! Good read Salil. Accounting and humour... a rare combination!!! Well done. Happy Belated Anniversary to both of you..
Salil, that was a very enjoyable read. Happy Anniversary to both you and Ambika. Thank you for stopping by my blog. It is my honour to have Jammy’s reader here. Hope to see you more often here. Ah finally, the Kranium himself..
10. He lectures the neighborhood kids selling lemonade on ways to improve their processes. 9. He gets all excited on Saturday because he can wear casual clothes to work. 8. He refers to the tomatoes in his garden as deliverables. 7. He finds that he needs PowerPoint to explain what he does for a living. 5. He wears gray to work instead of navy blue to make a bold fashion statement. 4. He knows the people at the airport and hotel better than his next door neighbors. 3. He asks his friends to "think out of box" when making Friday night plans. 2. He thinks Einstein would have been more effective had he put his ideas into a matrix. 1. He thinks a "half-day" means leaving work at 5 o'clock. My intend is to bring cheer to all your Monday mornings. But in case you don’t find a new blog one week, you may safely assume that aliens have landed in this part of the world and I am out there fighting to protect human race; unless of course, the aliens abducts me to write such funny blogs in their universe to bring cheer to their Monday mornings. Yes, we had a happy anniversary for the first time. I was in US and Ambika was in India. This is like the husband who confessed that the secret behind his successful marriage was that he and his wife dined out twice a week when they would be free of all possible worries in life like children, household, work, etc and partied freely – he on Wednesday and his wife on Friday. wish u a very very happy anniversary ! Thanks for visiting my blog, as that lead me to visit yours and am happy I did that. and wat a post man..i just loved the way u wrote...God bless u both!!! Thanks for your compliments and wishes. Remember, it will make me write more. Can you handle it? I know you meant, flair. Thanks again. Better late than never (but don't get caught!). Thank you for your kind words. :) Belated wishes to both of you! That was very sweet,intimate and a light hearted one..Belated wishes..May you celebrate many many many more happy years of life together..
useless and inferior. You have ruined me. For other men, I yearn. For you, I have no feelings whatsoever. When we're apart, I can be forever happy. Will you let me be? A tip for married men - When you live away from your wife (>1000s of kilometers helps), you can get away with just a dedication as anniversary gift! Thank you for passing by and the wish. And wasn’t that one too many? Btw, ‘happy’ did you say? Good writing skill sir. I appreciate. Belated "Happy wedding anniversary". And Advanced "Happy wedding anniversary" for next year and all the years to come.Warm regards and prayers for your daughter Niharika. "your blog says dont comment just because i commented on your blog"
and honestly i commented just because your post compelled me to do so which is wonderfully written and is just perfect. this is how every husband and wife should be like !! "We used to always hold hands after marriage because we wanted to make sure the rings did not fall off since we paid good money for them." Oh, and am I glad too that you found your way here? Thank you for commenting in the right spirit. I know you said one doesnt need to comment even if you left one on their blog. But I must compliment you on this post. It forced me to write a comment. It was a write up with a very smooth development. I could make out some jokes that you had used but the way you incorporated them was really awesome. Enjoyed the whole post thoroughly. Am bookmarking you for later readings. Keep it up. Happy wedding anniversary to you both. Thank you for your kind words and the anniversary wishes. And I am honoured for being bookmarked.